Difference between Category and Class Extension? -> In objective c, when you want to add some more functionality to a class without inheritance, you simply use category for it. -> Category use to add new method not properties. -> In objective c, when you want to make behaviour of some property private you use class extension. ->its come with .h file only. The appendGrid showed below demonstrated the basic functions. You can add/remove/move up/move down records! You may click on the “Load Data” button to simulate loading data into appendGrid! LAMP is short for Linux, Apache, MySQL, PHP. This tutorial shows how you can install an Apache2 webserver on a CentOS 6.4 server with PHP5 support (mod_php) and MySQL support. 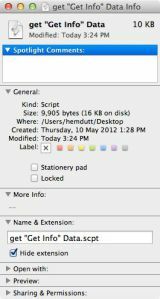 On Mac OS X , Information such as “creation date” , “type” , “size” etc. about a file or folder can be easily seen by cmd+click and selecting “Get Info” for the selected file in a panel as shown in the figure. Let’s see how can we get the information programmatically using AppleScript.